There is something about the holidays that makes me want to get organized. Come Jan. 1st you can almost always find me cleaning out a closet or organizing a cabinet in an attempt to dig us out from the whirlwind of baking, decorating, and gift giving from the previous month. Well this year, I tried to get ahead of the game by tackling our pantry before the holidays. It was less smart planning on my part, and more my husband telling me we really needed to do something about it. If your husband is the one telling you something needs to be cleaned, then you really know it needs help! I’ve never had a pantry before moving to our new home in July, and I must say it was one of the things I was looking forward to the most. Last year at Christmas, I remember having baking goods stashed in grocery bags in our bedroom for lack of space in the kitchen. 1. Large glass jars – great for corralling and showing off pre-packaged items. 2. 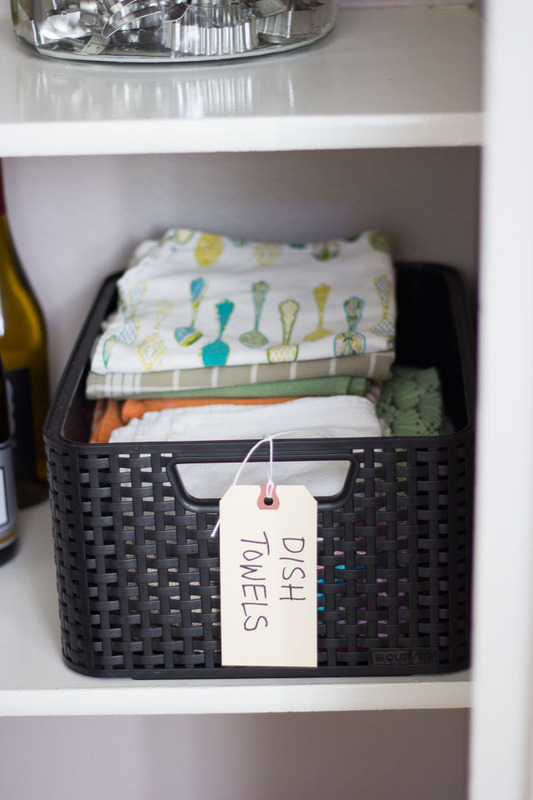 Woven plastic storage baskets – visually appealing and can hold a lot! 3. Snapware containers – great for storing baking staples with a pourable lid. 4. 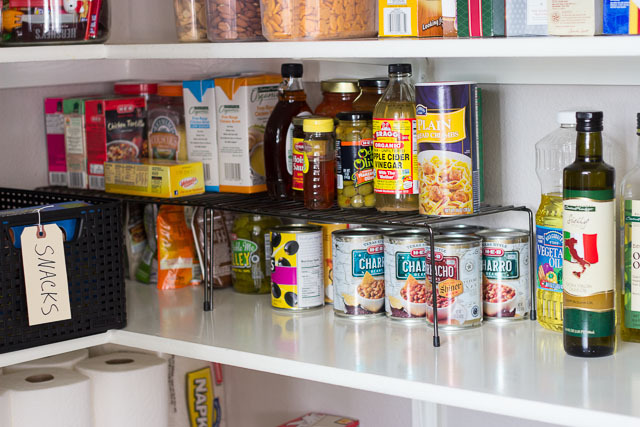 Shelf organizers – double your shelf space for canned goods. 5. Chalkboard labels – look great and can be easily relabeled. 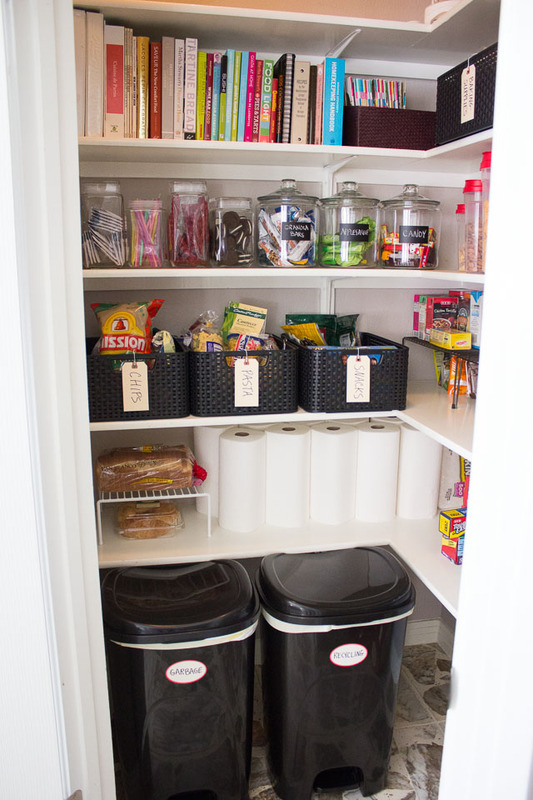 Pantry storage containers can be pricey. My pantry is a hodgepodge of containers partly because I waited to find good deals. I’ve found the glass jars at Target to be reasonably priced (under $10 each for the 1 gallon size) and also think the Snapware line of plastic containers are a good value. Thrift stores are also a great place to find glass storage containers if you are willing to go with an eclectic mix. Who doesn’t ooh and aah over those pantries in magazines where every single dry good is in a pretty glass jar. Unfortunately, in real life I need to keep my pasta in its bag so I have the cooking directions at hand, and emptying cereal out of the box into a glass container just doesn’t make sense to me. I opted for open baskets to reign in similar items. I found some pretty woven baskets and have one dedicated to pasta, one to chips, and one for other snacks. These baskets are 15″x11″x7″ and are similar to the “large” size of these baskets available on Amazon. In Texas it gets hot and humid in the summer, and baking items like flour and sugar can get icky and attract bugs if you don’t store them well, so decided to put mine in Snapware containers with a pourable lid. 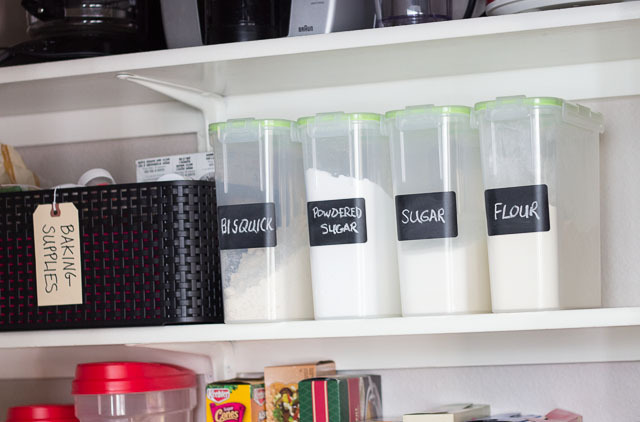 Labeling is a fun touch that automatically makes your pantry look organized. It’s not that I necessarily needed a label on my cookie cutter jar to tell me what was in there but it made it look pretty nonetheless! 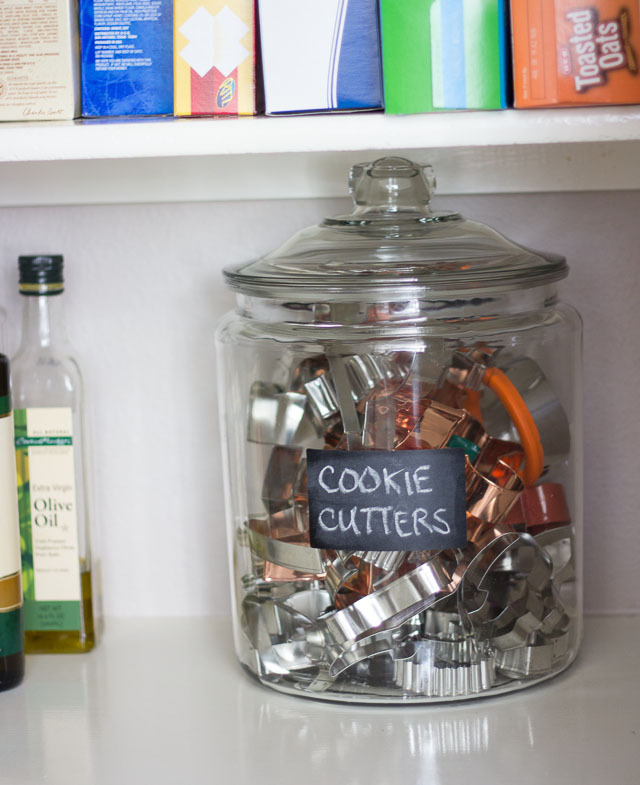 I used the 2-gallon glass jar to hold all my cookie cutters. 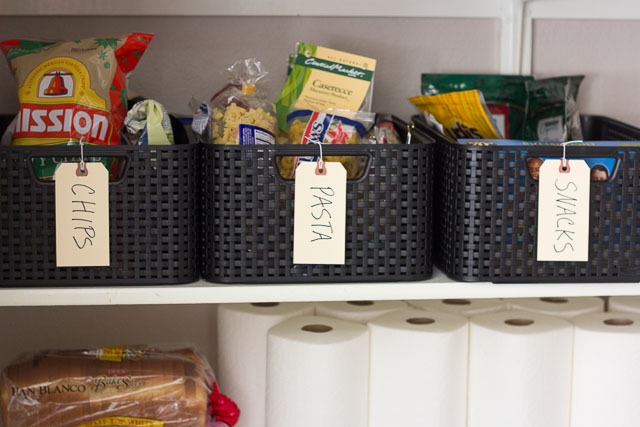 I used inexpensive manila tags as well as these chalkboard labels which I love because you can easily relabel them if you change the contents of the container. 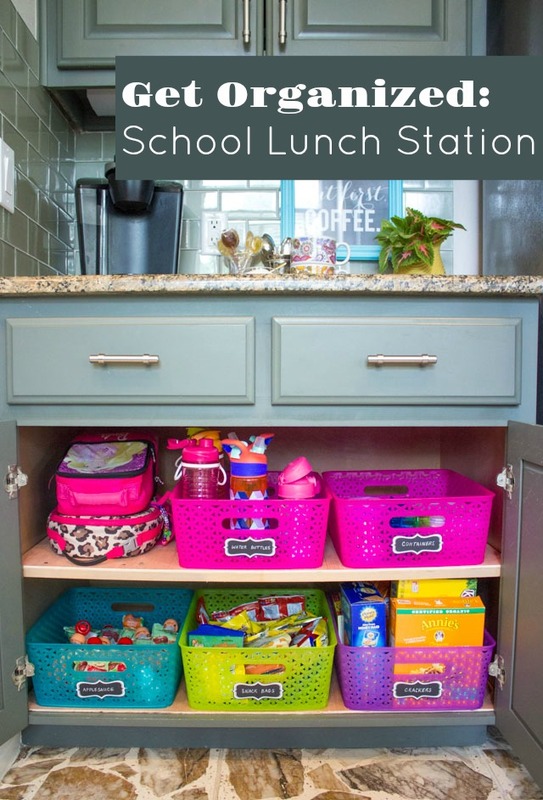 I used inexpensive kitchen cabinet organizers to double my storage space for canned goods and condiments, as well as for our bread. On the highest shelf I have small appliances like our blender and ice cream maker that I use infrequently (and need to get on a step stool to reach). The next highest shelf holds cookbooks and baking supplies which I also don’t use on a daily basis. I keep the candy and cookies just out of reach from my girls so they don’t think they can just help themselves when they want! Of course, this might not work if you have climbers, so do what makes sense for your family. 🙂 I put less interesting paper towels and extra garbage bags on the bottom shelf. 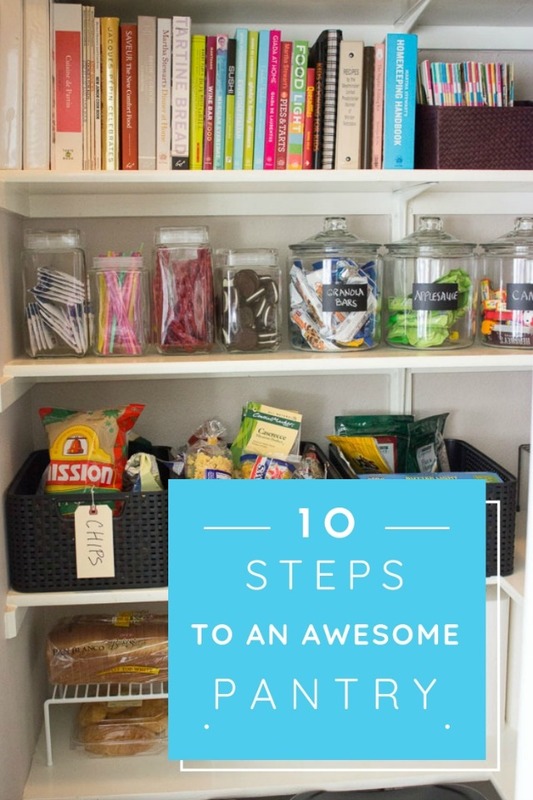 Pantries only look organized if they aren’t overflowing with stuff. 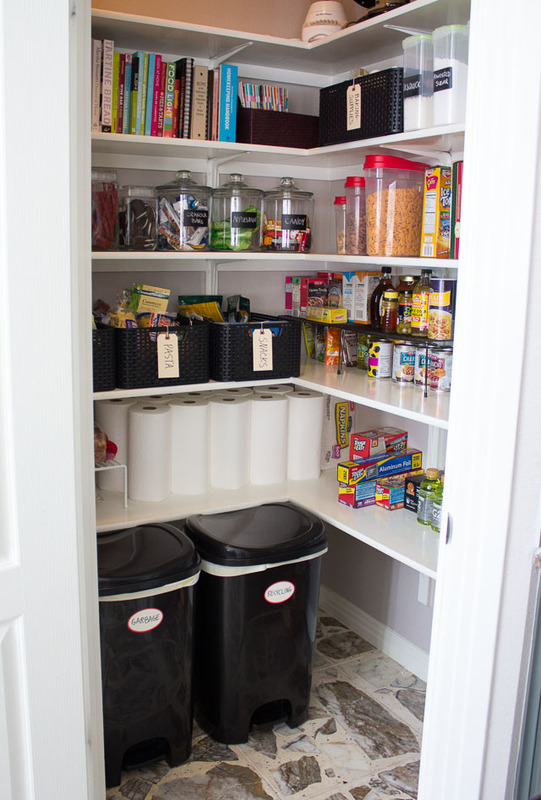 Go through your pantry and clean out old and expired items. 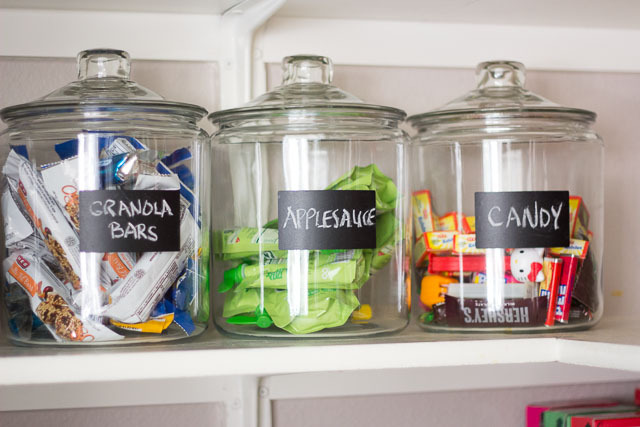 Buying bulk is good, but if you can, try to avoid buying more than your pantry can hold. We placed our garbage can and recycling bin on the floor to free up room in the kitchen and make use of the floor in the pantry. 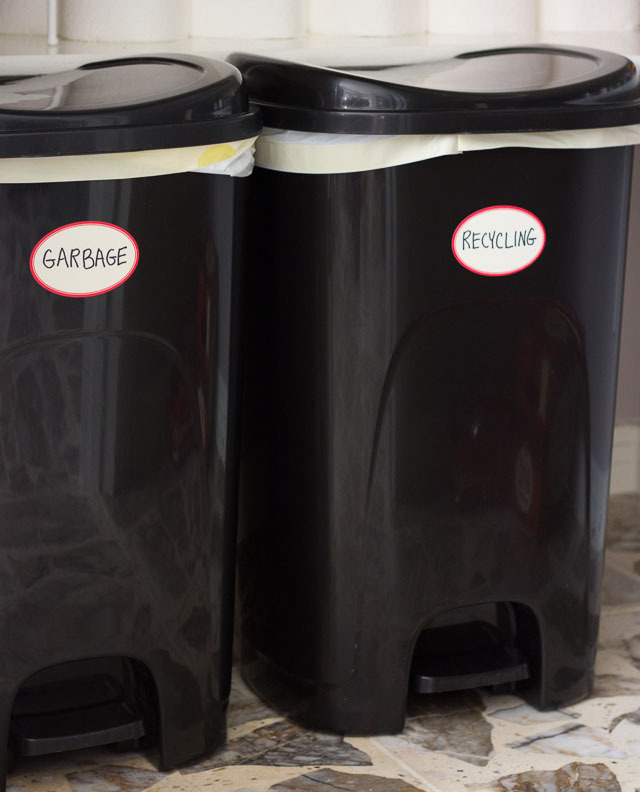 Of course we keep the lids closed, use the garbage disposal in our sink for food scraps, and take out the garbage regularly to keep the pantry area smelling fresh and clean. We also store extra canned drinks and water bottles on the floor of the pantry. While it doesn’t look quite as awesome as this one designed by California Closets, but it is a step in the right direction! 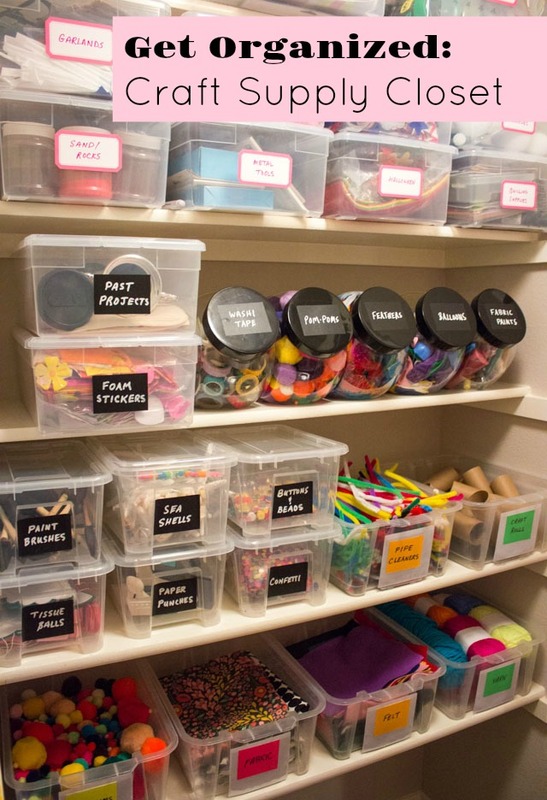 Like this pantry, then wait until you see my craft closet! This post is sponsored by California Closets. All content and opinions are my own.